It is snowing once more, so I am very pleased that yesterday we managed to catch a moment in the garden. Before getting started we checked on the worms and decided not to feed them for a while. They still have a lot to work through. I think we were adding food to fast to start with. The wormery came with some bedding which also served as food so we probably need slow down a little bit until some of that has been gobbled up. The worms are no longer trying to escape though, so they are obviously feeling more at home now. Then we got down to the real work; planting the last batch of broad beans. We did our first batch at the beginning of the sowing season with the intention of sowing successionally every couple of weeks, but good intentions went awry and now it is the end of the sowing season and until yesterday we hadn't returned to sow more. So yesterday we sowed a second and final batch of seeds to give a second harvest later in the season. 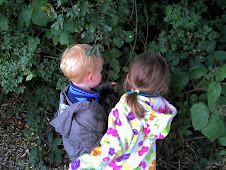 Our Little Garden Helpers were eager and helpful and they were both happy to pop seeds in holes and cover them up. The ground was wet so the soil was soft, making the conditions ideal for sowing seeds in our usually hard soil. Then we harvested a good selection of vegetables we had left in the ground over winter, including some spindly leeks, some lovey turnips and swedes, and a fresh, healthy looking selection of greens. They will make a lovely winter stew for dinner tonight to warm us up after playing in the snow. I also pulled up the last of the beetroots, which I should have done long before now. I will cook a few for tonights dinner and then pickle the rest. So at least whilst the snow has returned we can enjoy eating, if not planting, our vegetables. Hello ScentedSweetpeas, We keep the wormery in the garage to protect it from the cold weather, so if you had space in your shed or garage that could work for you? You guys are forging ahead, now keep warm.